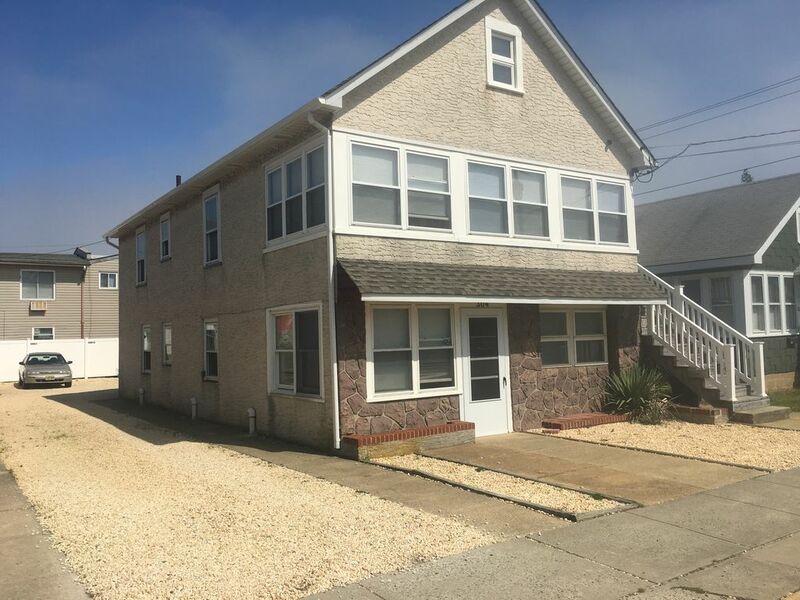 Sand N Seaside Beach Rental is a large house located at 304 Webster Ave in Seaside Heights. This house has across both floors 5 bedrooms and 3 full baths, and with pullout couches can sleep up to 18 people. This property is great for young adult groups during prom/graduation season (April to June) or for Large family rentals during July, August, and September. •	2 complete kitchens (one on each floor) which works out great for several families renting the one house together for a combined vacation. •	3 tile baths - 2 with showers, and one with a tub/shower. For Large prom groups or large family reunions/vacations, that are larger than 18, please see our other Home away properties. We often have large groups or family reunions rent all 3 houses listed in these 3 Homeaway ads. They form a big self contained complex that can sleep up to 52. In April, May, and June we rent our property out for Young Adult Prom/Graduation rentals, and in July, August, and Sept. this property and all the surrounding properties are rented only to families with young children welcome, as we offer a quiet family friendly environment during this period. For Prom/Group rentals we can accommodate small to large groups. We have family run security on the premises during these group rentals to ensure you have a no worries experience. For our group rentals we rent on a PER PERSON basis depending on the number of nights you are staying. For a 2 night rental the cost is $200 per person. For a 3 night rental the cost is $275 per person. For a 4 night rental the cost is $335 per person. In July and August we rent to families only. The cost for this rental house is $2750- per week. Our weekly rentals normally run Saturday to Saturday. The 304 Webster Ave house has 5 bedrooms and 3 baths and can sleep up to 18 across both floors. It is a short walk to either the beach/boardwalk or the Bay. Has all conveniences including, central air conditioning, 3 flat screen TVs, WIFI, laundry room on property with several washers/dryers, natural gas grill so never have to worry about propane tanks running out, elevated deck, paver patio, outside sand shower, and off street parking. We also provide 10 Seasonal Beach badges for your use (An $80/day value.) Close to Boardwalk and Amusements, Island Beach State Park, and one hour from Atlantic City. A great family place. The 2nd floor of the house has two bedrooms and one tile bath with tub/shower, and can sleep up to 10 people with the three additional pull out couches there. It has an elevated deck in the back of the house, a large eat in kitchen, two bedrooms (one with a queen sized bed and one with a full sized bed), a big living room that has two queen sized pull out couches, and an enclosed sun porch room across the entire front of the house with a 3rd pullout sofa bed. The 1st floor of the house has 3 bedrooms and two full baths, and with a queen sized pullout leather couch can sleep up to 8 people. This floor also has complete kitchen with Granite countertops and new appliances. Of the 3 bedrooms, one Bedroom is a master suite with queen sized bed, and its own tile full bath as well as TV. The 2nd bedroom has a full sized bed and the 3rd bedroom has a pair of twin beds. The Scuderi Family has been renting houses at the NJ Shore for over 40 years. Now being operated by the second generation, we offer modern updated properties with all the comforts of home....These are clean places with the personal touch of a family maintained and operated business. Great Location in Seaside Heights, located on Webster Ave which is central to everything. We are approx. 3 blocks or 16 houses from the beach/Boardwalk, a few block walk to the water park, great restaurants, close to the clubs (if night life is your thing were 3 blocks from Karma or Hemingways and 5 blocks from the Bamboo), fishing/crabbing piers, jet ski rentals, local park with tennis courts/basketball courts, etc. Were also 2 miles from Island Beach State Park which has rustic Pristine beaches, 40 minutes from Great Adventure, and 1 hour from Atlantic City. We offer on site laundry room with several coin operated washers and dryers, natural gas grills (no propane to run out), outside sand showers, central AC, WIFI, and off street parking. We also provide seasonal beach badges for your use during your rental. With all our properties located together, we can handle a single rental or rent a whole house or multiple houses for a family reunion or prom/group rental in April/May/June. Our 304 Webster Ave property (this Home Away Ad) can sleep up to 18, our 308 Webster Ave. property (Home Away ad # HA 4786883)can sleep up to 20, and our 312 Webster property (Home Away ad # HA4804183) can sleep up to 14. So small or large families or groups is not a problem. We offer personal, hands on service to ensure you have a great stay. Our summer residence is the front house at 312 Webster Ave, so you have the property owner on the property all summer to ensure all your needs are cared for. Enclosed shower - outside sand shower. reserved off street par for 2 cars. On Street parking also available with no meters. Can rent boats for crabbing or jet skis at public doc 1/2 mile from house. elevated deck in the back of the house off the kitchen, Paver patio with table and chairs. Our extended family of 14 (including 7 kids between ages of 7-14 and one set of grandparents) stayed at the house for a week in the middle of August. Because of its convenient location, we enjoyed being able to easily go back and forth to the beach and boardwalk, even with all of our beach equipment. We spent one day at Island Beach State Park, and one day kayaking/doing the water trampoline park on the bay side. The upstairs living room was big enough to fit all of us to play Pictionary. We also enjoyed dining outside by the grill. Joe was extremely friendly, understanding, and helpful during our entire stay. We would recommend this house to anyone seeking a stress-free vacation at the shore. Just as wonderful as the first time!! This was our 2nd time at Joe's and it was great. We brought some friends along as we said we would and even sent Joe some other friends weeks prior. All have the same reaction... we're all coming back. The apartment was nice and spacious. The layout was amazing and having 2 young kids with us, made a lot of sense. We had the 2nd floor of unit 304 and really enjoyed the back balcony. The apartment had everything we needed and lots of room to spread out. As always the units are clean and very welcoming. It really is our home away from home by the sea. The walk to the beach is a hop and skip away, with just the right amount of activities to do around and on the boardwalk. Really enjoy how close we are to the beach and Joe provides us with beach passes for our stay. A great saving there. Joe is often onsite and ready to help or suggest places to go. He's a real gem! All one big happy family at Joe's and we always meet great new people who are also repeats. We will continue to return, continue to bring or suggest family/friends to try Joe's properties. Best place in Seaside Heights, NJ. We had a lovely time, despite some of the littles getting strep throat. I am a little disappointed at the cleanliness of the facility, but that was easily remedied, and we did bleach after the kids were diagnosed, so no worries to anyone reading this. What was really nice was that it really was in walking distance - a little over a quarter mile - to the beach. Very relaxing, and a very nice walk. Very close to the Acme and a very good Chinese restaurant around the corner from the Acme. Seaside Heights is very nice, with plenty to do on the boardwalk, including a nice little amusement park. The restaurants along the boardwalk and the pizza (3 Guys, I think it's called) are really good. You definitely get your money's worth there. So, overall, my stay there was wonderful. Joe, the owner, was more than helpful and helped ensure our stay was very pleasant. Glad you and your family enjoyed your stay with us. We strive to make your stay as pleasant as possible. Sorry to hear you had an issue with the cleanliness of the house when you arrived. We have a professional cleaning service that comes in and cleans our houses between rentals to ensure everything is top notch. If they missed something or there was something that needed attention you only had to let us know since our office and summer residence is 2 houses away and we would have been right on top of it to make it right. Next time please let us know right away. We really enjoyed our stay at Sand 'N' Seaside Properties. It was exactly what we were looking for and exactly what we saw online in the listing. No hidden surprises here. The apartment was clean, comfortable and fully loaded to make it our home away from home. Joe was great, very helpful and full of information for us newbies in Seaside, we really appreciated having him onsite. We had off-street parking, and felt safe onsite. Joe has gone to great lengths to make sure his tenants are safe on his properties and that was great for us having been with 2 kids. We were supplied beach passes which came in handy for our stay and the beach was a close walk. One of my favorite parts about staying at Joes was after having spent a couple of hours at the beach, we could come back home to our private terrace and enjoy some drinks in sheer peace. We had a very nice time at Sand N Seaside Properties. Very clean house, great location, close to beach and in walking distance to fishing pier and water park. We will be back next summer. I stayed here for Memorial Day Weekend with 50 of my friends. It was one of the best weekends of my life and it was all thanks to Joe and his amazing properties. He was so accommodating, friendly, and overall just a very nice guy. The houses were great too. We all fit within three of the houses comfortably with no problems. Joe also had a couple of security guards for during the night who were just as great as he was. They made sure everyone and everything was in check but still managed to let us have a great time. Overall, I had an amazing experience here and would love to do it again next year. Park and its prestine beaches. Atlantic City. Great family place.